I have apples on the brain these days. They’re omnipresent on my road, brightening the neighborhood like Christmas ornaments on their trees. They’re also abundant this year at orchards again; new flavors seem to ripen every week. I eat at least one a day. I should be doing this because apples are healthy. I’m actually doing it just because I love them. 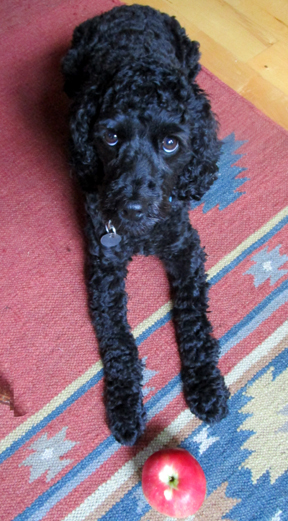 My dog Cocoa smells the juice of recently picked apples whenever I bite into one and patiently (well, almost patiently) waits for a bite or two. Apples will be my theme when I teach my next class at the Baker’s Pin next week. 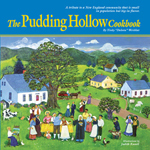 On the evening of Thursday, September 21, I’ll return to Northampton, Massachusetts, to create a whole meal with apples, from appetizer to dessert. 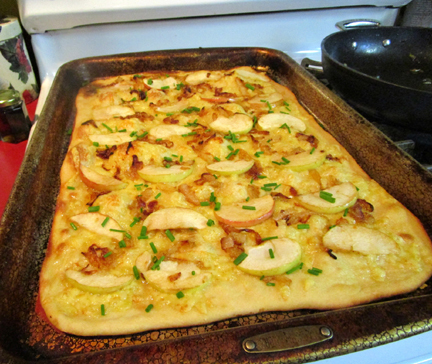 In fact, I recently devised one of the recipes below for that very class—my Apple Gruyère Pizza. When I made it on Mass Appeal last week, the pizza was completely consumed before the end of the hour-long show. 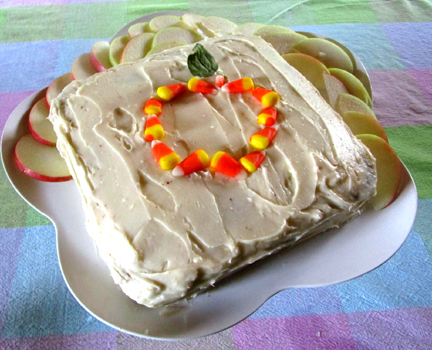 The swamp cake that follows is an applesauce cake I made years ago for the birthday of one of my favorite people in the world, my former roommate Alice from Dallas. Alice dubbed it “swamp cake” because of its tendency to swamp down in the middle. The swamping didn’t bother either of us; we just applied a little extra cream-cheese frosting in the swampy area. If you know anyone in western Massachusetts who would like to join me at the Baker’s Pin, please tell him/her/them to register here. Slots are still open. Enjoy the crunch, taste, and versatility of apples as we approach fall! If you want a lighter pizza or are serving vegetarians, brown the onion in extra-virgin olive oil instead of bacon fat. (Add a small amount of salt and pepper when you add the apple and garlic.) For vegetarians, omit the bacon on top; for light lovers, cut down on the bacon on top. A couple of hours before you are ready to make the pizza, take your pizza crust out of the refrigerator (if you are using a commercial crust; if your crust is homemade it won’t need cooling), place it on a greased baking sheet, and let it rest. After an hour and a half or so, preheat the oven to 475 degrees, lightly grease the baking sheet, and stretch the crust out on top. If you are paranoid like me, you may want to line the baking sheet with parchment, foil, or silicone. In a large skillet fry the bacon. Remove it from the pan and place it on paper towels to drain. Set aside. Leave enough of the bacon fat in the pan to cover the bottom of the pan lightly. (You won’t need the rest of the bacon fat.) Toss in the onion slices, and cook them over low heat until they begin to caramelize (probably 20 minutes to 1/2 hour). Throw in the garlic and the apple chunks and cook the mixture for another 5 to 10 minutes. Remove the pan from the heat. Sprinkle most of the cheese on top of the pizza crust. Sprinkle the onion mixture on top (it won’t make a heavy topping), and top with the rest of the cheese. Bake the pizza until it looks done, 10 to 14 minutes. While the pizza is baking, crumble the bacon and chop the chives. When the pizza comes out of the oven, sprinkle the chives and bacon pieces on top. Let the pizza rest for a minute or two; then slice it. Serves 4 as a main course or 8 as an appetizer. Preheat the oven to 350 degrees. Butter and flour an 8-inch-square pan. Cream together the butter and the sugars. Add the applesauce. Beat well; then beat in the egg. Beat in the baking soda, salt, and spices. Stir in the flour, followed by the raisins. Spoon the batter into the pan, and bake until the cake tests done, about 25 minutes. Cool and eat plain or frost. Serves 8. Instead this past weekend I paid tribute to the holiday with my favorite Louisiana main dish, Jambalaya. I first encountered Jambalaya (or a form thereof) in college. The cooks at Mount Holyoke included something they called “Creole Jambalaya” on their monthly menu. In general, the food at Mount Holyoke was pretty tasty. As I recall, however, the Jambalaya was neither tasty nor Jambalaya. It was creamed shrimp and some sort of other protein served over rice. I was unimpressed. In Knoxville, Tennessee, however, I learned that I like Jambalaya A LOT. 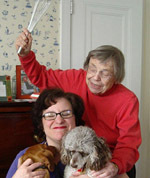 My roommate at the University of Tennessee, Alice Gagnard, hailed from Alexandria, Louisiana. Alice made fabulous Cajun food. The gumbos! The po’ boys! The Jambalaya! I have yet to master the craft of gumbo, although I did get a great recipe from Cajun folklorist Barry Ancelet a couple of years ago. 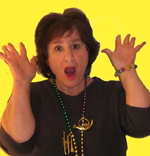 I hope this coming summer to share with you the po’ boys Alice makes with her husband Kevin. Meanwhile here is a recipe for Jambalaya. This dish is appealing on a lot of levels. First, it is relatively inexpensive to prepare since you can mix in a combination of whatever forms of protein suit your budget (or lurk in your refrigerator). 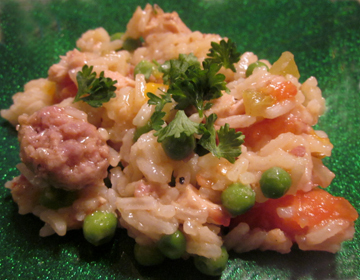 In addition to the chicken and sausage below, Jambalaya may be enjoyed with ham, shrimp, and even crawfish. Second, its form (or lack thereof; it’s a very flexible food) reflects the mixed heritage of Louisiana itself, where French, African, Native American, English, and Spanish influences abound. In an article titled “Jambalaya by Any Other Name,” food and travel writer Andrew Sigal describes his extensive research into the possible origins of the dish. He concludes that different cooks (and fans) may always have different ideas about where it came from. This pretty much sums up Jambalaya as far as I’m concerned. How can one not love preparing a recipe that means “rabble” and that sound like “jumble”? Happy Mardi Gras! 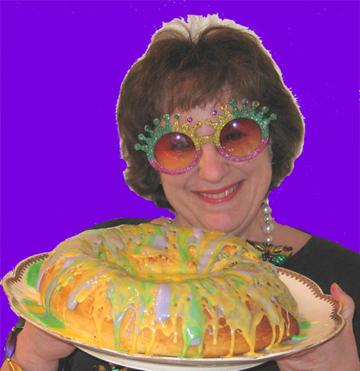 I can’t find most of my Mardi Gras attire, alas, so I leave you with a photo of me from a couple of years ago when I made King Cake. In a heavy Dutch oven brown the sausage pieces. If they are not very fatty and start sticking a lot, splash in a little olive oil. If they are very fatty, drain some of the fat off when they have browned. Remove the sausage and set it aside. In the fat (plus a little olive oil and butter if needed) sauté the onion, celery, bell pepper, and garlic. Cook them until they soften and begin to smell wonderful. Use their juices and the fat in the pan (plus a spatula or wooden spoon) to scoop up any brown bits from the bottom of the pan. Return the sausage to the pot, along with the chicken, the seasoning, the hot pepper, and 1 cup of the stock. Bring the mixture to a boil. Cover, reduce the heat to low, and simmer gently for 1/2 hour, stirring from time to time. Add the remaining stock. Bring the mixture to a boil, and stir in the rice. Return the mixture to boiling, stir, and reduce the heat and cover again. Simmer until the rice is cooked through but not dry, about 1/2 hour longer. Taste for seasoning and add a little more spice if you like. 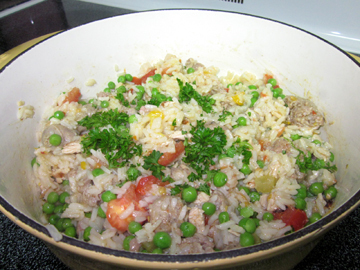 Stir in the tomatoes and peas. Sprinkle parsley overall and serve with Tabasco sauce on the side.